We’d love your help. Let us know what’s wrong with this preview of The Wild Water Series by Jan Ruth. Three complete novels in one download. Also available as individual books. The tragedy and comedy that is Jack's life; secrets, lies, long lost loves and family ties. The tragedy and comedy that is Jack's life; is there a future for him and Anna, or is the past too destructive? Jack Redman, estate agent to the Cheshire set and skilled juggler of complex relationships. Someone to break all the rules, or an unlikely hero? In this sequel to Wild Water Jack and Anna return to discover that history repeats itself. Anna's long-awaited success as a serious artist is poised to happen, but her joy, along with her relationship with Jack, is threatened by old scores. Simon Banks is a depressed and unstable man with a plan. He wants to wipe out his past by buying a brighter future, but Jack Redman stands in his way. Will Jack ever escape the legacy of lies and deceit left by his ex-wife? Can Jack and Anna hold it all together, or will tragic repercussions from Jack's past blow them apart forever? To ask other readers questions about The Wild Water Series, please sign up. I’ve been having a bit of a tough time recently, and have been struggling to enjoy my reading. And this wonderful series was everything I wanted it to be – it’s taken me a ridiculous length of time to read at a few chapters a night, but on those days when everything was just too much to cope with, I can’t begin to tell you the pleasure it gave me to escape to Snowdonia and Jack Redman’s complicated life. I thought Jack was just wonderful. But he’s certainly not a conventional romantic hero. First I’ve been having a bit of a tough time recently, and have been struggling to enjoy my reading. And this wonderful series was everything I wanted it to be – it’s taken me a ridiculous length of time to read at a few chapters a night, but on those days when everything was just too much to cope with, I can’t begin to tell you the pleasure it gave me to escape to Snowdonia and Jack Redman’s complicated life. I thought Jack was just wonderful. But he’s certainly not a conventional romantic hero. First of all, he’s an estate agent – now how can an estate agent be a hero? And his life is desperately complicated – he has all the trappings of the perfect life with the trophy wife, the Cheshire mansion, the three perfect (well ok, not quite…) children, the nurturing parents. But then things begin to fall apart – in spectacular style, as the cracks in the perfect picture begin to widen and the story becomes one of a flawed but lovely man desperately trying to keep afloat as life throws everything at him. On top of everything else, he then finds himself shuttling between the Cheshire branch of the agency and the other branch in North Wales when his father falls ill. There he meets again the wonderful Anna, his childhood love, an artist living in a remote farm amid the beautiful Snowdonia countryside, who is also finding life difficult to cope with. I read Wild Water first, and separately – and that book establishes the characters (and what wonderful characters they are).and hooks you into Jack’s life. 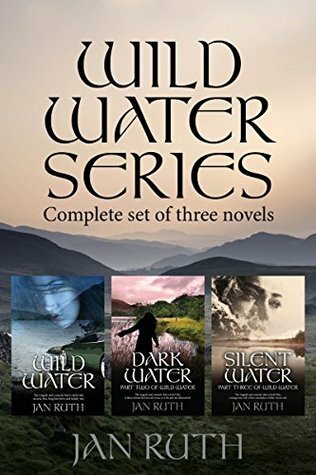 Dark Water and Silent Water – which I read back to back – take everything in a quite unexpected direction, as lies and dangerous secrets threaten to blow everything apart. And the story really does become very dark indeed – a compulsive read, dramatic and emotional, as characters you thought you knew act in ways you never would have expected. Jack himself is a wonderfully complex character – impulsive, quick to anger, slow to forgive, and his actions sometimes drive the story into uncomfortable places. He’s also tender, loving, a wonderful father – and 100% human, authentic and believable. He keeps your sympathy throughout – although it must be said that he does test your patience at times. All human life is here – the darkness, the joys, the day to day challenges, the sadnesses, and plenty of the funny side too. In fact, I should mention the humour, quite perfectly judged – much of it coming from Lottie, but I particularly enjoyed some of the situations stemming from Jack’s flat sharing. And then, underpinning it all, there’s the setting. I remember the author’s vivid descriptions of the landscape of Snowdonia from when I read Silver Rain, and again this story is largely set against the background of that breath-taking scenery, quite magnificently described in its wild beauty and majesty. Wild Water begins the story of Jack Redman who works in the Cheshire branch of his family’s very successful estate agency business. To all outward appearances he has it all, the up market car, the big house, a beautiful, if high maintenance, wife and three lovely children. But Jack’s life is thrown into turmoil when Patsy, his selfish and materialistic wife, admits to an affair and leaves the family home with their younger daughter. Jack has felt something was amiss for a while but certainly was Wild Water begins the story of Jack Redman who works in the Cheshire branch of his family’s very successful estate agency business. To all outward appearances he has it all, the up market car, the big house, a beautiful, if high maintenance, wife and three lovely children. But Jack’s life is thrown into turmoil when Patsy, his selfish and materialistic wife, admits to an affair and leaves the family home with their younger daughter. Jack has felt something was amiss for a while but certainly wasn’t expecting the train wreck which was now his life. And things were getting worse. His father has had a health scare leaving Jack to run both the Cheshire and North Wales branches. Jack is run ragged and very unhappy. Meeting up with Anna, his first love, in Wales, when she lists her farm for sale is the only thing keeping him sane.